The ATO has released ATOID 2014/39 and ATOID 2014/40 which set out the ATO’s view that the NALI (non-arm’s length income) provision applies to the non-commercial LRBAs involving related parties. The Australian Tax Office advised that these ATOIDs should not be seen as concluding that all related-party LRBAs give rise to NALI. What aspect of loans will the ATO scrutinise? 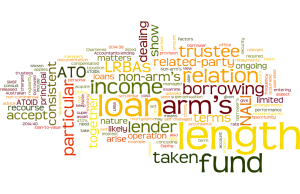 The ATO are likely to closely examine related-party LRBAs where the terms of the loan, taken together, and the ongoing operation of the loan, are not consistent with what an arm’s length lender dealing at arm’s length would accept in relation to the particular borrowing by the fund trustee. To be able to show that NALI (non-arm’s length income) does not arise, a fund trustee entering into an LRBA with a related-party borrower should acquire and keep documentation that enables them to show that the terms of the loan, taken together, and the ongoing operation of the loan are consistent with what an arm’s length lender dealing at arm’s length would accept in relation to the particular borrowing by the fund trustee. Those matters listed above, taken together, would need to be shown to be consistent with what an arm’s length lender dealing at arm’s length would accept in relation to the particular borrowing by the fund trustee. Note that in relation to particular circumstances, there may be other matters that would also be relevant. For any taxation advice in relation to the self managed super fund loans and income, consult the team of Chartered Accountants at our Epping office.